Looking for handyman gift ideas for dad. Here are a few “must haves” for your home which is used often for fix-ups. 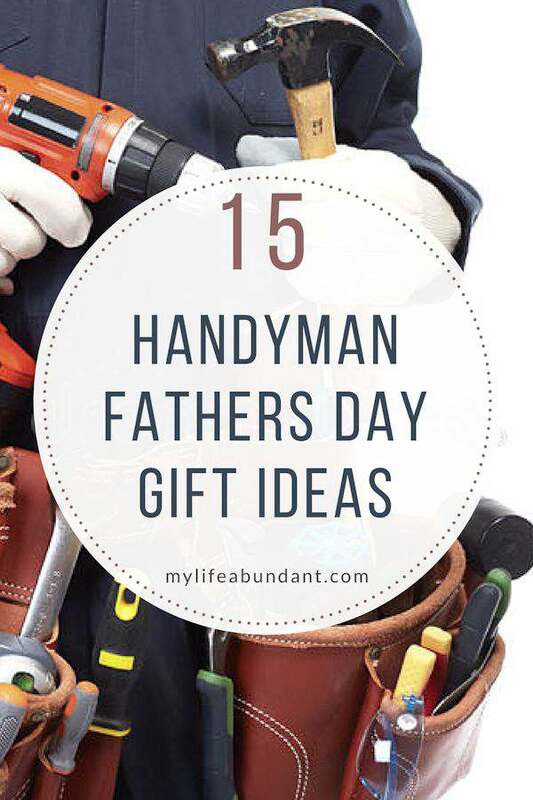 Fathers Day is right around the corner and for those of you who have a handyman in your family or someone who is wanting to start their collection of tools, this is a great list to start with. And gals, these are perfect for you too. I have my own toolbox with a few tools I need around the house sometimes. Basic Tool Set – The perfect first tools to own to start off with. Tape Measure – Large print tape measure is so much easier to see. Ratchet Screwdriver – The most used tool we have. I even have a pink version for myself. Level – From hanging a picture to hanging wallpaper, there are so many uses for a level. Maglite Flash Light – Durable and comes in several sizes. Perfect for the home, garage and car. Stud Finder – Easiest way to find studs without putting several holes in the wall. Portable Air Compressor for Tires – Keep this in the car and you will never worry about having a flat tire on the road. Portable Car Battery Charger – Another item for the car for a quick battery jump. Rechargeable Work Light – For the DIY handyman to use and not worry about cords. 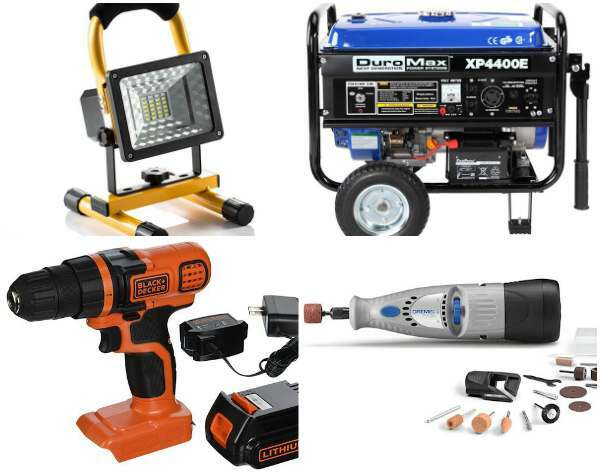 Portable Generator – A perfect solution for times when the electricity goes off. Cordless Drill Set – Great for all the DIY projects. Dremel – One of my hubby’s favs. You can do so much with a Dremel. How To Books – Just learning how to use tools? Having a reference book may come in handy. Subscription to Family Handyman – The only magazine my husband reads. Bucket Boss Tool Organizer – Saved the best for last. This organizer fits over a 5-gallon bucket and holds so much. We actually have two of these. My husband does love tools. Now if he would love using them to fix things. My husband has many of these things but her really wants an air compressor. The battery charger would come in handy too. My husband has a lot of the right tools, but he is not very handy so maybe if I get him the magazine he can learn new things and become better at home improvement. My husband would love any one of these. He is a handyman through and through. If he doesn’t know how to do it, he learns. I love it! Thanks for this great list…now to pick something out. Good picks. Bucket boss tool organizer looks appealing to me. Might consider this one as my present to Dad this coming Father’s day. No doubt that dads are the repair men around the house. I think these tools would definitely make them happy! Awesome gift guide! These are awesome gift ideas. My husband is looking forward to getting tools. Those are some serious boys toys you have there! I bet any handyman dad would love to receive it! These are all great gift ideas. My husband is very handy and has tons of tool already, but these would be great for my son in law for Fathers Day. These would really be wonderful for a young father or even a grad! how awesome! 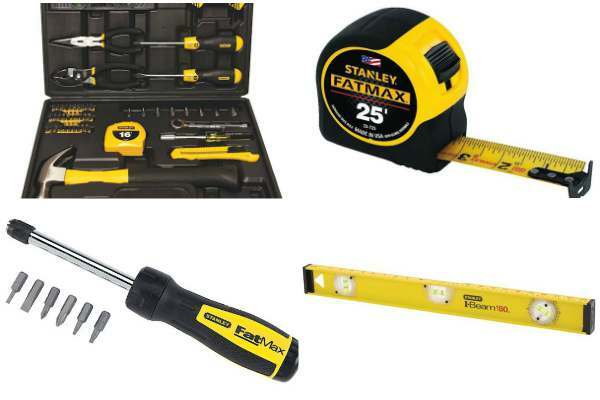 these are perfect gift ideas for father’s day…I would love to get a new set of tools for my dad. Thanks for sharing! These are fantastic ideas for Father’s Day! What man doesn’t like tools??? My husband just bought himself a staple gun at Target. He is quite handy, so this is a great gift list for him! I would love to have all these stuff. I remember my husband saying that I am the very first woman he dated that ever owned her own tool box. Haha. I work well with drills and tools so we sort of save some money for simple repairs. My husband would like to have a power generator though. He just hates it when the power goes out. awesome 15 here, i will gladly have to get each and everyone of these for my dad, he is my best friend and deserve all the good things of life. so cool to know of these.